Please be advised– bats droppings can carry diseases. For this reason having bats in your attic can be highly dangerous to human beings as well as other animals. We suggest that you regularly check your attic to ensure that bats haven’t take up residence there. The following are indicators that bats may be present. Nuisance Wildlife Removal, Inc. is your expert for bat removal in Manatee and Sarasota County. Call now to speak with a trusted professional. For more information or a FREE estimate call 1-866-263-WILD or 941-729-2103. Do you see bats at either sunrise or sunset? Since bats are nocturnal animals, its doubtful that you will see them during the day. However if one is in fact flying around in the early morning or at night, there may be more bats that have taken up residence in your attic. Do you see bat droppings? If there is an infestation of bats in your attic, you will probably find droppings aka guana, at the entry points to your home. Additionally, you may find droppings on decks, porches, windowsills and inside the attic. Do you hear chirping sounds? Listen for any chirping sounds particularly in the evening, at dusk or at dawn. Bats navigate through their echo-location system. Do you hear scurrying or scratching sounds in the walls? If you do, this might indicate a colony of bats in your attic. As a result of their being a layer of grease on the bat’s coat, a greasy spot is left when the bat enters and exits the home. Be on the lookout for these spots around the holes in your house, on the walls and even on the roof. Typical bat traffic pattern. Notice dirt and oily surface. Do you have concerns about bats in your area? 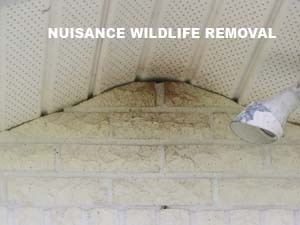 Nuisance Wildlife Removal Inc. is your expert for bat removal in Manatee and Sarasota County. We are locally owned, family operated and fully licensed and insured.